Manchester City midfield ace David Silva has announced his retirement from international football, having helped Spain to both World Cup and European Championship glory. The 32-year-old former Valencia playmaker departs after scoring 35 times in 125 appearances for La Furia Roja, having been a member of the squad who triumphed at both Euro 2008 and Euro 2012, as well as the World Cup in South Africa in 2010. I leave happy with all I have achieved, experienced and dreamed with a team that will be remembered forever. 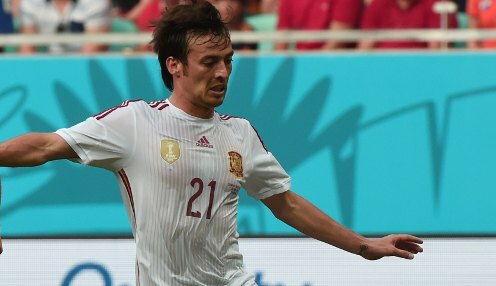 Silva, the sixth most-capped player in Spain's history, made his international debut in December 2006 against Romania, while his last appearance came in the World Cup 2018 last-16 loss to tournament hosts Russia. He follows fellow Spain stalwarts Andres Iniesta and Gerard Pique in calling time on his international days. Silva posted on Twitter: "It is not easy, after everything I have experienced, to sit down and write this. "There have been days and weeks of reflection and analysis to make the decision to finish my time in the Spain national team. Without a doubt it is one of the hardest decisions in my career. "The national team has given me everything and has allowed me to grow as a player and as a person from my first days in the youth set-up. "I leave with pride after playing 125 games and scoring 35 goals in a 12-year spell where we lifted the World Cup and two European Championships. "I leave happy with all I have achieved, experienced and dreamed with a team that will be remembered forever." Spain can now be backed at 11/2 to be crowned champions at Euro 2020, with Germany available at 7/1 and World Cup 2018 winners France priced at 10/3.